We need a game where Ross runs a one shot and everyone plays Ross. It’s always comedy gold. Gonna give this a shot even though the mechanic of a Jenga tower (as a guy who stopped doing a lot of things because his hands shake) absolutely does not appeal at all. So yeah I agree with James a one-shot where each player is a different member of RPPR flanderized. They basically already did that in Duality: The Spa, one of the side-episodes of Ross’s Eclipse Phase campaign. Lonnie, I can totally understand that. Dan was having some similar problems during this game, as I recall. My brothers and I have the opposite problem: we’re all very good at Jenga, which means there’s not a lot of suspense until extremely late. I think the house-rule I came up with helped level the playing field a bit, though. Dan wasn’t the only one, at that. Add me, Michelle, and Eric to the list of people with grip issues. We just had to play our Jenga game a bit smarter. Which makes the scene where michelle and Bill went toe-to-toe that much more awesome. Did Ross just make a reference to Dark id’s Drakengard LP? Ross, love the Dead Rising references. The Doom comic, actually, where I assume the LPer also got it from. It’s a pretty famous quote. Somewhere Thad is glaring at the moon and he doesn’t know why. it amuses me thoroughly that there actually was a mystery to uncover and the players were just like NOP. this may be the first RPPR game where the PCs failed to even notice there was a plot and collectively decided to flee from it. also eyyy it’s Ethan wooo. Dread is just the best. why is it the one-page RPGs so often seem to work better than the giant tomes? Love the game hearing this version of it. Plus with the genius work of putting PvP into Dread, I for one am going to throw this idea out there to GMs to help get the Paranoia RPG setting back into the spotlight as I think that putting the Paranoia RPG setting into a PvP version of Dread like this would be stellar. Plus in Dread with PvP, and Paranoia, if you die you can keep playing for a while with slightly more broken clones until you hit the clone limit for the game. As always great job everyone & shame that there wasn’t more photos or video to see the tower in the often verge of calamity. Thanks for the kind words, Darren! As for running Paranoia with the Dread system: that sounds like it could be a lot of fun. However, I do find that Dread’s mechanic has a way of pretty narrowly limiting the style of a game, which might interfere with Paranoia’s typical feel. With Dread, even in full-on PvP, you’re going to have a pretty long succession of successful actions, ending in a single disastrous failure. Even with people who don’t think of themselves as being very skilled at Jenga, you can easily have 20 or more successful pulls before a tower fall. But in Paranoia, at least in my personal experience, a lot of the comedy comes from extremely high failure rates, as errors pile together into a huge fiasco. One house rule I might think about for Paranoia Dread would be to have half of the successful pulls result in a failure or complication rather than a simple success. Maybe you could label 1/3 of the bricks “FAIL”, 1/3 “SUCCEED”, and 1/3 “COMPLICATION”, written on the non-visible bottoms of the blocks, then build the tower with a random distribution. A player is then not allowed to switch blocks once he starts pulling one, even if he sees the label. Or alternatively you could use a set of playing cards, with each suit signifying a type of result (maybe Full Success, Succeed at Cost, Fail but Make Progress, and Fail Hard). After each tower pull, then make a draw from the deck. Then you could get your nice continuous snafus, while still building up to a final disaster. 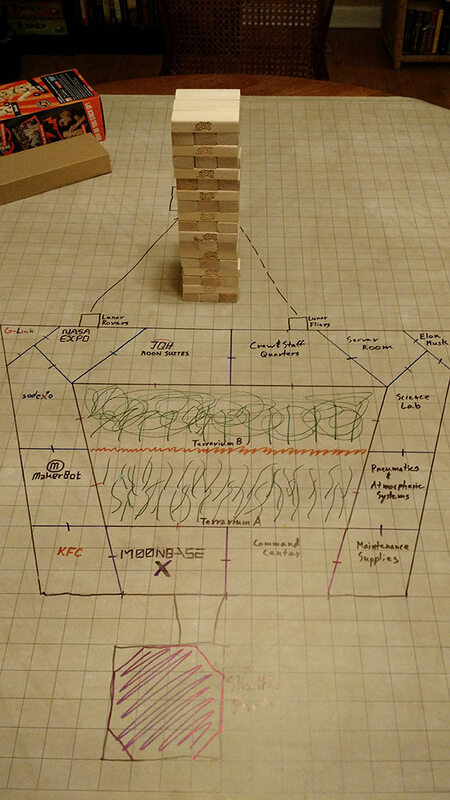 Or heck, lose the Jenga tower and just put a Joker or two in the deck that represent deadly failure. After each draw, remove the drawn card and reshuffle the deck, increasing the Joker chance. You’re not scaring me, Ethan. Ross, I’m afraid you get no say in the matter. You died on the moon.